It’s almost been twenty years since Italian automaker, Alfa Romeo, has launched a car in the United States—unless you count the very limited 8C Competizione supercars that made a brief appearance in 2008, but 500 models is hardly enough to satiate an entire nation. All that is changing as Alfa Romeo plots its return to America at next months’ New York Auto Show to showcase the Alfa Romeo 4C sports car. The 4C is powered by a direct-injected, turbocharged 1.75-liter four-cylinder engine that lays down 240 hp. Throttle response is enhanced by the engine’s special intakes and aluminum block. On a rear-wheel-drive platform, the 4C includes a seven-speed dual-clutch gearbox with a full automatic mode and a manual mode (via paddle shifters). The engine is also marked by its “scavenging control system” that eradicates turbo lag. This monster of an engine rockets the 4C from 0 to 60 mph in just 4.5 seconds. Top speed is limited to 155 mph. Aluminum suspension frames, mounted to the carbon tub, include double-wishbone and MacPherson strut designs for improved handling. Drivers will also enjoy the “DNA selector,” which lets them choose among Dynamic (D), Natural (A), and All Weather (A) modes. (Clever, right?) There’s also a special Race mode, but DNAR is significantly less cool sounding. The Alfa Romeo 4C’s curb weight comes in at just about 2,100 pounds. The 4C is 13 feet long with a wheelbase just below 8 feet. Height measures in at 3.9 feet, and width is set at 6.5 feet. The interior, while small, shines in its simplicity. It’s got two seats and a minimalist design marked by carbon fiber and aluminum. 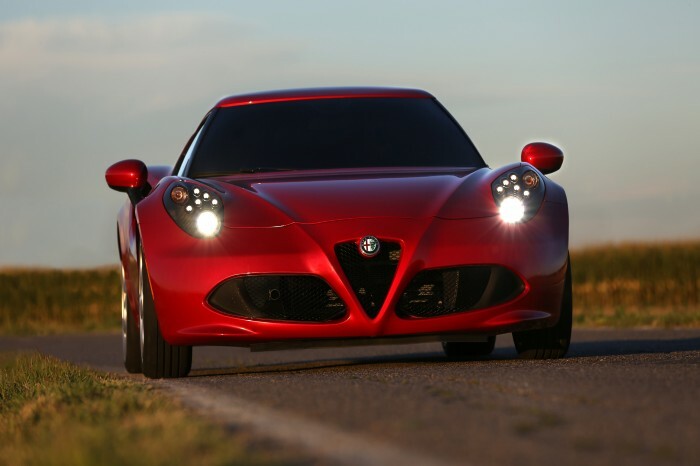 After the auto show in April, the automaker will begin selling the Alfa Romeo 4C in June for somewhere around $54,000. It is rumored that Alfa Romeo will also bring the 4C Spider concept to the New York Auto Show; the concept debuted at the Geneva Motor Show earlier this month to much fanfare.